Listen to the full album at 7 Digital! The vocalists are not mentioned for each song in the booklet, here are the names as far as I know them: Alex Mills (Puppy Toy), Veronika Coassolo (Veronika, the lyrics are also written by her), Joseph - a man who sang on the street (Joseph), Rodigan (Bacative, Baligaga), Lubna (Past Mistake, School Gates), Hafdis Huld (Cross To Bear). The video for Council Estate was shot in Aulnay sous Bois, a Paris suburb. It is directed by Valeri Pierson. You can watch it on Vevo and other places. The video for Puppy Toy was directed by Dominic Leung, you can watch it at Vevo and other places. The Bullion Remix is also on the Puppy Toy single, so basically there are no new tracks on this release. Slow is a cover song, the original is by Kylie Minogue (see details here). or read all the lyrics together here. Check out a direct comparison of cover and original here. After years of fighting shy of a media hellbent on portraying him as a dour specialist in subterranean beats and scowling at cameras it seems that he's finally at peace with his own identity. The result is an album that dazzles and never disappoints. „Slow“ klingt hier wie der böse Bruder ihres Originals. So will man diesen finsteren Gesellen hören. Nett sind andere schließlich schon zur Genüge. 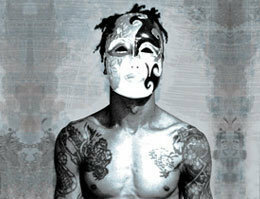 Tricky's boundless optimism and zest for musical exploration are positively cheering. After a five-year recording hiatus, the maverick singer and producer is back with "Knowle West Boy," out today and easily his best album since 1998's "Angels With Dirty Faces."